NORTH ATTLEBORO, Mass. – It may have only been the second week of the season and both teams had yet to even play a handful of games this fall, but the intensity of the play on the pitch Wednesday night was reminiscent of a playoff game or at least when these teams meet with the Blue-Red Cup on the line. It was tight, it was physical, and in the end it was tied. 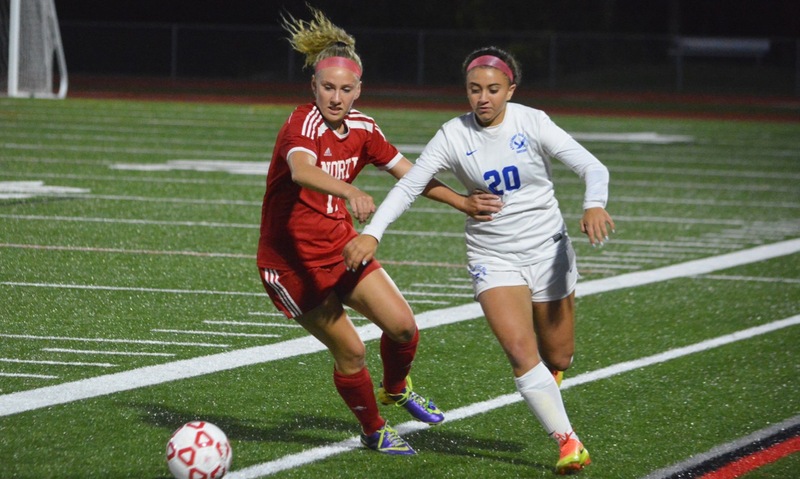 Briley Harnois scored with 15 minutes left in the game to cancel out Kayla Pasquel’s first half strike and earn Attleboro a point in a 1-1 draw with North Attleboro on the Beaupre Field turf. The Rocketeers created enough chances over the course of the game that on another day, with more composed finishing, they could have pulled out the victory. But, for all the chances created by the hosts, the two goalies finished with the same amount of saves because North struggled to put the ball on frame. Ashlyn Gaulin was the primary focus of the Attleboro defense, with several players taking turns to man-mark the senior forward (who has accounted for six points in a game twice already this season), but she was still able to work scoring opportunities. Just seven minutes in, Gaulin’s nifty footwork opened up the Attleboro defense but her shot from the right side of the box was right at Bombardiers goalie Tayla Drape. Seven minutes later, Gaulin flicked a pass through the defense to Pasquel, who then gave it right back but the shot went over the bar. North found its breakthrough in the 23rd minute. Again it was Gaulin who opened up the Attleboro back line, showing off her skill to get space on the left side and then deftly chipping a cross to the back post. Pasquel beat her defender to the ball and bundled it over the line for a 1-0 advantage. While Attleboro was not getting as many shots on goal, the Bombardiers were giving North’s defense something to worry about on the break with the speed of Harnois and fellow sophomore Isabella Salviati keeping the Rocketeers on their toes. 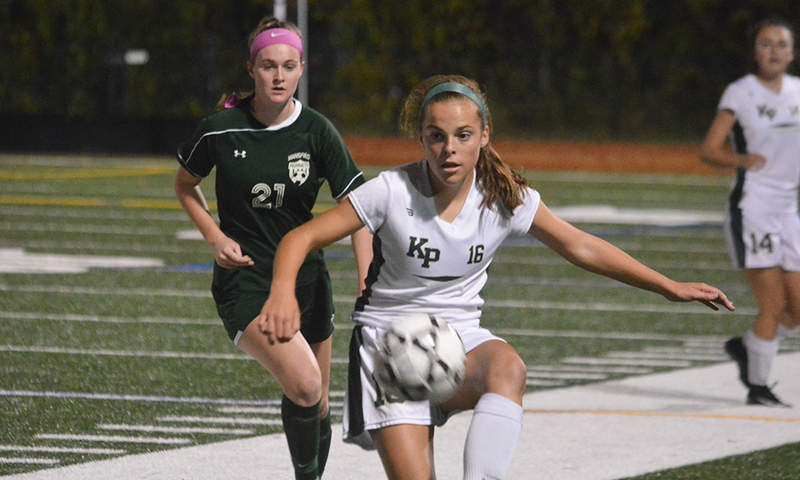 Senior defenders Sam Hawkins and Bishop Feehan transfer Olivia Bishop both had to cut out chances. After Julia Reyes had a shot from the right wing that went into the side netting, Attleboro got its first shot on target in the 35th minute. A Harnois free kick from 25 yards was saved under the bar by a leaping Emma Noreck. Just a minute later, Emma Gaulin sent in an angled free kick from nearly midfield that found the head of Haley Ferrin, but the header was right at Drape. North had one more chance before halftime, as Emma Gaulin played the ball through to Lydia Santos, who picked out Ashlyn Gaulin, who then fed Pasquel, but again the final shot was too high and off target. The Rocketeers continued to get shots off early in the second half. Pasquel teed up Alex Moulson racing in from the left side but she could not keep the shot down under pressure from Ashley Lauzier and Gaulin and Pasquel combined again for a chance only to have the shot smack off the football goalposts. As long as the game stayed 1-0, Attleboro felt like it had a shot. In the 55th minute, Jessica Gates got free on the right and her cross went all the way across the box to Reyes, who had her shot blocked. The rebound bounced to Salviati but again the shot found the leg of a North defender. Three minutes later, Gates had a long free kick that Noreck was able to catch. In the 65th minute, the Bombardiers found an equalizer. Salviati ran onto a bouncing ball down the right side and played a clever, one-touch pass in behind the North defense that Harnois was able to run onto. With Noreck racing off her line to cut down the angle, Harnois made no mistake with a rasping finish into the far corner. After the goal, Attleboro had momentum and nearly took the lead but Reyes’ cross was just in front of Salviati on the edge of the six-yard-box. North had one last chance in the final six minutes, but Gaulin saw her line drive free kick held by Drape. Attleboro (1-2-1) will try to build on the draw when it hosts defending league champ King Philip on Monday. North Attleboro (2-0-2), which moved into a one-point lead in the Davenport, will host Taunton on Saturday morning.